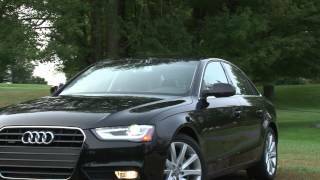 Audi unveiled the re-designed A4 at the Detroit Auto Show 2012. 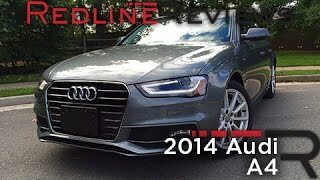 The Audi A4 2013 receives design treatment on the exterior as well as the interior. The all-new A4 has a striking new exterior design with accentuated horizontal lines, arched engine hood, tapered upper corners of the single frame grill, and three-dimensionally highlighted cross ribs and Audi rings. The interior of the A4 models has also been refined, with reconfigured climate and infotainment controls, and exclusive wood inlays. The switchgear, steering wheel, and instrument panel have also been enhanced with chrome and high-gloss applications. 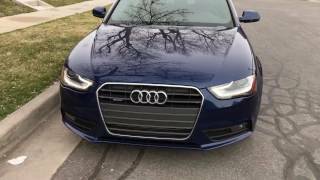 Audi brings intelligent technologies, efficiency, exhilarating driving dynamics, state-of-the-art infotainment and new design elements to the best-selling Audi A4 series for the 2013 model year. Now in its eighth generation, the Audi A4 – known for its progressive design, sportiness and efficient performance – is available in Sedan and sporty S4 models, and – making its re-entry into the U.S. market – the iconic Audi allroad quattro. The chassis of the A4 is striking with its sporty precision, high ride comfort and superior safety. Aluminum components of the five-link front suspension and the trapezoidal-link rear suspension provide responsive handling and are optimized to reduce weight. The electromechanical power steering is new in all models of the series and requires no energy for straight-ahead motion, thereby reducing emissions of up to 11g/mile. In addition, it is lighter than the previous hydraulic steering system further improving efficiency through its reduced weight. Exclusive to Audi, the A4 model also features Audi drive select, a system that adjusts the vehicle's transmission shift characteristics, throttle response, and dynamic steering. On the S4, the Audi drive select system can also control the adaptive damping suspension and quattro sport differential. Audi drive select offers 27 distinct driving configurations, allowing drivers to configure vehicle drive characteristics exactly to their liking with their choice of Comfort, Auto, Dynamic or Individual settings. The Audi A4 series has a striking new exterior design with accentuated horizontal lines, arched engine hood, tapered upper corners of the single frame grill, and three-dimensionally highlighted cross ribs and Audi rings. The A4 has redesigned bumpers with angular air inlets, revised grille, and rectangular front fog lights. The allroad quattro is easily recognizable with its flared wheel arches, vertical chrome struts in the grille, and round fog lights. The headlights have also been redesigned both in terms of their exterior shape and the arrangement of the lighting elements. The unmistakable LED daytime running lights have been redesigned and make the A4 instantly recognizable. The interior of the A4 models has also been refined, with reconfigured climate and infotainment controls, and exclusive wood inlays. The switchgear, steering wheel, and instrument panel have also been enhanced with chrome and high-gloss applications. The result is a further strengthening of the benchmark interior on the A4. All interior colors – except black – have been re-coordinated and the upholstery range has been revised with Fine Nappa leather. Inlays are now available in Aluminum Trigon, Walnut dark brown, fine grain Ash natural, and layered Oak. The interior of the S line sport package comes in black, refined with high-quality applications. 17-inch wheels are standard on the A4, 18-inch wheels are standard on the S4 and allroad, and 19-inch wheels are optional on all carlines. The A4 Sedan’s luggage compartment has 17 cubic feet of space, and 34 cubic feet with the seats folded down. The A4 allroad quattro has 28 cubic feet of space and 50 cubic feet with the seats folded down, respectively. An electrically-operated tailgate is available for the allroad. 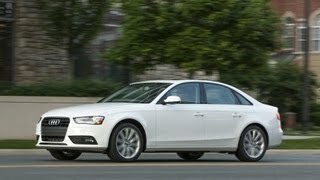 Audi offers several advanced technology features for the A4 family, including adaptive front lighting and Audi side assist, which monitors the space behind and beside the A4 by radar and detects any vehicles in the neighboring lanes. Driving in the A4 is also enhanced by the optional Driver Assistance package, which features adaptive cruise control that keeps the A4 at a constant distance from the preceding vehicle, active lane assist, and dynamic steering. Dynamic steering varies the effort as well as the steering ratio. Active lane assist allows the steering to help maintain lane discipline should the driver begin to sway outside of the lane markings without setting the turn signal. Audi is the first company worldwide to feature factory-installed wireless internet, enabling the innovative infotainment system called Audi connect™. Previously available in the A6, A7, A8 and Q7, Audi connect will now be available on all A4 models, making Audi the only brand worldwide to feature this level of integrated connectivity in the B segment. −	Factory-installed wireless internet, enabling features such as Audi connect™ for real-time weather, traffic, news and live fuel prices. First introduced in the A7, A4 models will be first in the segment with factory installed internet connectivity.